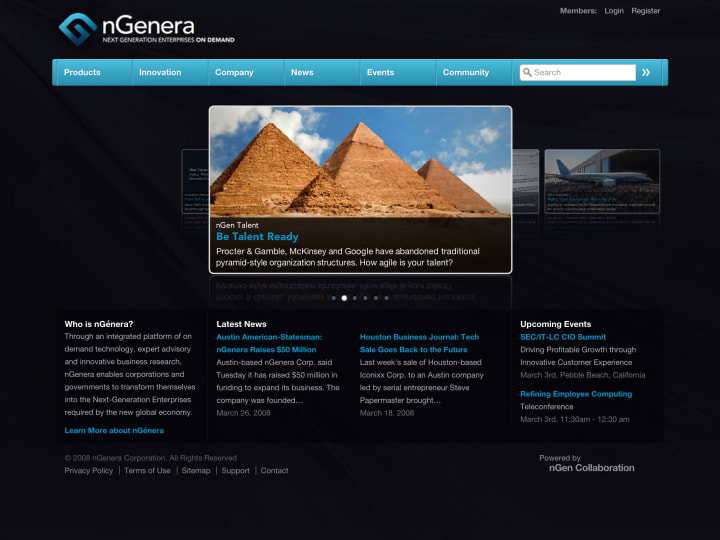 nGenera Corporation (now Moxie Software) helps companies and governments transform themselves into forward thinking enterprises, that is to say organisations that enable employees to communicate via real-time social software platforms and tools. 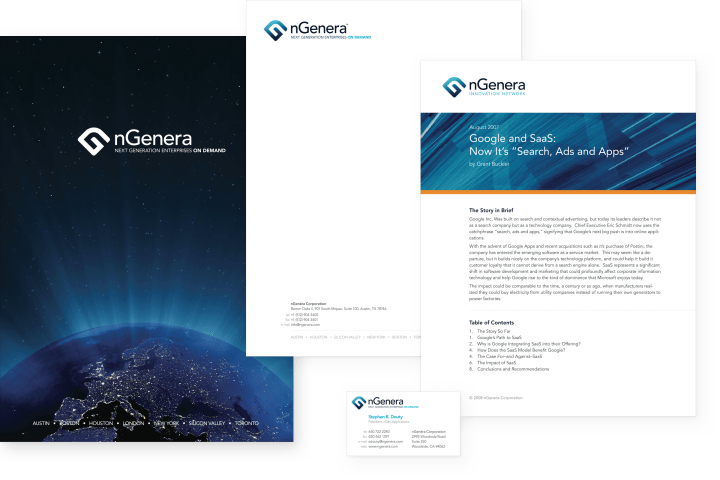 Steve Douty, President of Platforms, Applications and Marketing, asked me to take the nGenera name and build a brand that could encompass the company’s growing suite of software products and consultation services. With this intriguing new name, the logo needed to reflect the organisation’s broad ambition, and signify a break with any past notions of enterprise software. Combining an ‘n’ and ‘G’ was a subtle and intriguing way to symbolise interconnectedness while also creating a symbol similar to those commonly associated with networking and connectivity. This distinctive mark could work at many sizes, with flat and rendered versions created to suit different applications. To account for a range of operating divisions, I created a brand architecture that meant future acquisitions could easily be integrated. With other in-house and third-party teams responsible for implementing the brand, I provided overall guidance and created example collateral pieces such as reports, signage and business cards. For the company’s web presence, I sought to distinguish nGenera by creating an immersive and premium experience, realised through the use of deep blues accented by highly saturated colours from the complementary palette. Associated brand collateral, including presentation folders, report covers, letterheads and business cards.